Research shows that omega-3 fatty acids, and particularly EPA, play a significant role in emotional stability and mental health. In fact, higher omega-3 fatty acid intake is associated with decreased risk of depression and seasonal mood changes. Developed by naturopathic physician and essential fatty acid authority Dr. Alan C. Logan, Omega3 Plus Joy is an enteric-coated formula with concentrated EPA, proven to assist in regulating mood, including depression. 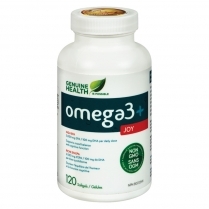 Omega3 Plus Joy provides a natural way to improve state of mind.